Hello world! This is Ros, Code Club’s new Operations Assistant, checking in & giving you an update on things here at HQ. 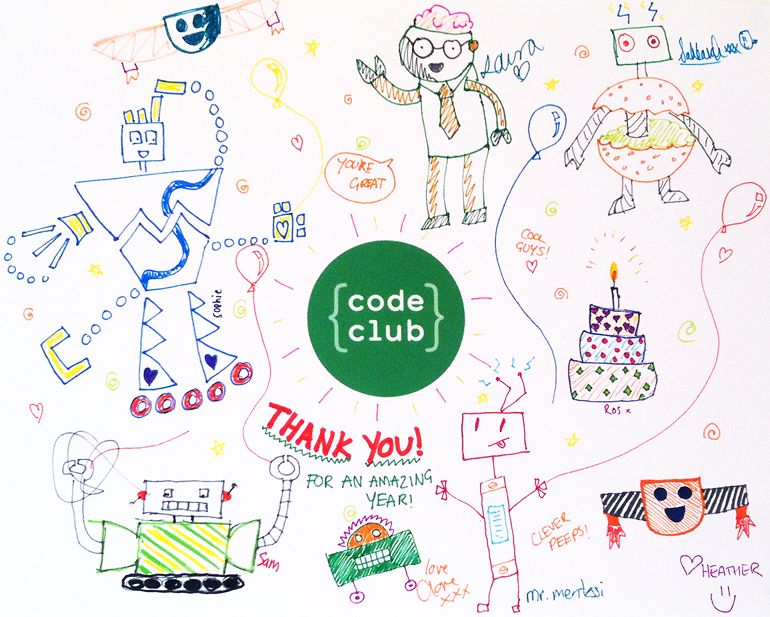 Thank you volunteers, thank you teachers, thank you thank you co-ders! Your work this year has made such a difference to coding in the UK — and across the world! We hope you’ve had a wonderful time, and are looking forward to starting up again come sunny (we hope) September. Please remember we’re here for you: if we can help you in any way, don’t hesitate to get in touch. And do share your stories and hijinks with us; there’s not much that makes us happier here in HQ than hearing about the awesomeness of our clubs! One of the first things I’ve been involved with since arriving has been our giveaway of DIY Gamer Kits with our friends at Technology Will Save Us. Everything got allocated at lightning speed! It’s been really wonderful hearing about your plans for the kits, and discovering for myself the enthusiasm of all our volunteers and teachers. I can’t wait until we have more shiny things to give away again, and if you’ve been lucky enough to be allocated with kits this time do please send us your pictures and stories! We want to spread our coordinators all across the UK, to give our network of volunteers and clubs the best possible support. If you think you’re the right person to help us, take a look at the coordinator vacancies we currently have open, and do give me a shout if you have any questions or need a bit more information. There’s a star cluuub waiting in your school! Whether or not you appreciate the delightful tunes of the semi-official Code Club Office Choir, we hope you’ll be tempted by the opportunity to become one of 20 Star Clubs: amazing clubs with sky-high ambitions, which are able to welcome visitors and show them how wonderful Code Club is. Our Star Clubs will be showered with love (of course), but there’s also some excellent swag on offer; applications close on Wednesday 13th of August, and you can find all the details over here.